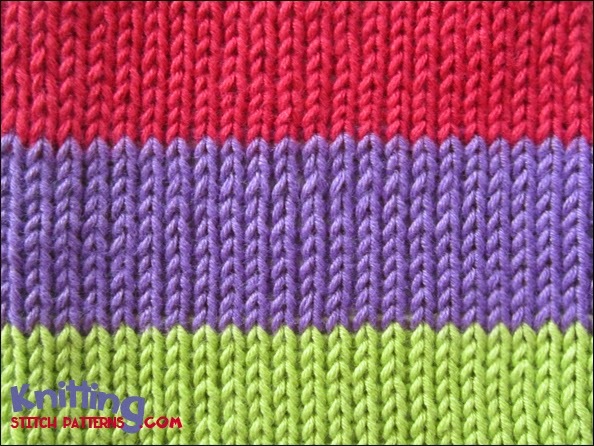 This knitting pattern can be worked on any number of stitches. Row 1: With color A, knit all sts. Row 2: With color A, purl all sts. Repeat rows 1 and 2, 4 times. Row 11: With color B, knit all sts. Row 12: With color B, purl all sts. Repeat rows 11 and 12, 4 times. Row 21: With color C, knit all sts. Row 22: With color C, purl all sts. Repeat rows 21 and 22, 4 times. Repeat these 30 rows till necessary for completing your project.